Just finished watching the The Treasure Sword of Hapsburg DVD starring Yuzuki Reon, my first time seeing her show. One of the students at the school lent me the DVD and Reon's her favourite sienne at the moment. 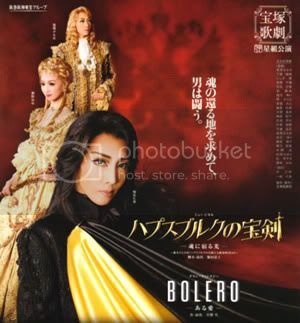 The story's not as romantic as most other Takarazuka shows I've seen but it was still very beautiful. I'm not too familiar with the Hoshigumi siennes since Aran Kei retired so it was a nice chance to get to know their performances. I thought Kaname Ouki was really good, and Suzumi Shio's really beautiful, like I literally paused the video the first time I saw her because it was like "WHOA!". There was also an otokoyaku who I thought who looked a lot like Mizu Natsuki. She didn't appear too often, but she was always wearing a purple outfit, with long blonde hair and a member of the Hapsburg Empire in the show. I think it might be Makaze Suzuho judging by her picture on her TakaWiki page but I'm not too sure.